It’s Giving Tuesday- for those who don’t know, this event happens annually on the Tuesday after Thanksgiving. Giving Tuesday is essentially the nonprofit world’s version of “Black Friday” or “Small Business Saturday” and gives consumers a chance to take a break from the flurry of holiday shopping and consider donating to a cause or charity that’s important to them. Whether you’re making a one-time donation, setting up small monthly gifts, or donating in honor a loved one, this is the easiest and most immediate way to support sarcoidosis research. Visit our donation page to learn more about giving to FSR and make a tax-deductible donation to help stop sarcoidosis. Ask loved ones to donate to FSR instead of getting you a gift this holiday season. This is a great way to support sarcoidosis research while also raising awareness of this horrible disease within your circle of family and friends. Get the conversation started about sarcoidosis and help us spread the word- you can share it on social media, send out an email or mention it in person and ask others to substitute a holiday gift for a donation to FSR. Be sure to link them to our donation page so they can easily donate on your behalf. 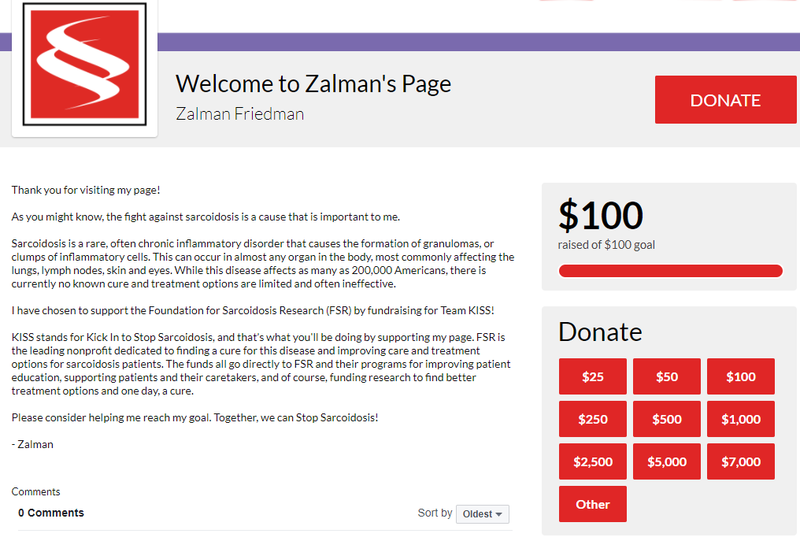 Use our new online fundraising platform to setup a fundraising page and share it with family and friends to have a lasting impact on sarcoidosis research. It’s quick and easy to do, and can be used year-round as a way to raise awareness about this disease and support for FSR’s critical research initiatives. All donations to FSR are tax-deductible to the fullest extent allowed by law.